Abstract As a surprise, the new object model of PHP5 compared to PHP4 has in most cases a worse performance. Though creation, destruction and referencing of objects perform better features like extending abstract classes, implementing interfaces or reading class constants show a remarkable performance impact between 3 and 51 percent. This does not imply to avoid the use of the new features. Instead one has to choice between performance and reliability or maintainability of the code. We found as a result of further tests, this does not hold anymore for PHP 5.1.0b3. 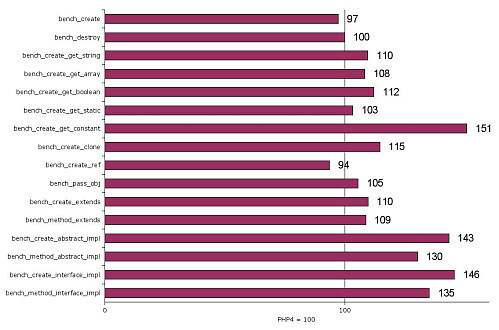 The next version of PHP shows a remarkably better performance compared to PHP 5.0.x. (see Benchmark 5.1.0).